"Mockingbird" caught me by surprise. Given the title, I was expecting the episode to focus on Littlefinger. He may have got the most exciting moment of the hour, but the rest of the episode was intense with emotion and character development. Well-crafted is the best way to describe it. Thoughts on the episode and a list of my favorite quotes after the image. - Where to start? Mockingbird may be the most emotional episode of Game of Thrones and probably my favorite of the season so far. I teared up at so many characters... Bronn, Oberyn, Tyrion, Sansa, Hot Pie, the Hound. It wasn't all heavy emotions either. Some of them came colored with a bit of hope. Goodness knows that's not something we often get from Game of Thrones. - If memory serves, the story Oberyn told Tyrion matched the books almost word for word. Pascal delivered it perfectly and by the time he said he would fight for Tyrion, I nearly stood and cheered. - At first, I wanted to be upset with Bronn. However, Tyrion captures it when he said he liked Bronn because he wasn't trying to pretend he was a better man. Bronn has simple desires and if he can have them fulfilled without Tyrion, well, I don't blame him. Their last handshake and Tyrion teasing about the song they'd write about him defeating the Mountain... sniffle. - Was anyone else surprised that the Mountain seemed to arrive in King's Landing in no time at all? I'm not sure how much time passed since the last episode, but I didn't get the impression it was very long. 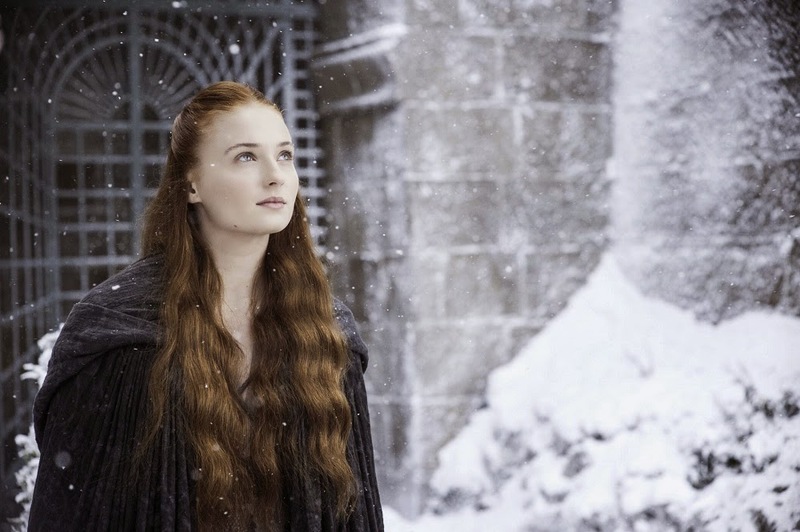 - When I saw the promo image for the episode featuring Sansa in the snow looking happy I didn't get it, but as soon as the scene started, I said out loud, "Ohhh, it reminds her of Winterfell." Duh. I thought it was beautiful that she rebuilt her home from memory. It's weird to remember that this is world where she wouldn't have a picture of Winterfell. - Littlefinger. His time in the episode can be summarized thusly: GROSS and YAY. I was surprised to hear them change the line from "only Cat" to "your sister." - I clapped when I saw Hot Pie. While he was amusing as he talked about how to make the ideal kidney pie, he also had a touching moment. His second direwolf bread looks much better than his first attempt. Also, still completely adoring the Brienne and Podrick team-up. - While I respect the fact that Arya is a survivor and a badass, she's also scaring me. How many kills is that now? It's weird to see it unfold on the screen and weirder that I know I'm still rooting for. She's headed down a sketchy path. - Oh wow, the wounded look on the Hound's face as he told the story about his brother burning him. I just wanted to hug him ala Good Will Hunting. - Dany: Well played. Both because of Daario and listening to Jorah. Loved this episode! So many storylines were attended to and none of them Theon. Yay! - Littlefinger I hate you, but come the end of the episode I was glad that he exists. When reading the books I cheered for him at this point as Lyssa and her Robyn were two of the more perpetually annoying characters to see print. - Arya (my favorite character) is certainly traveling this dark path. It is always amazing how people root for her and yet she is becoming this decidedly more disturbed and dangerous character. I love her and her story, but sad to see what her violent world has done to a little girl. - Jon Snow...he actually DOES know something, but the Crows refuses to accept that. The Master Builder though an his long pause was a great sign that he and others are not exactly enthused with the current leadership. - Agreed that Oberyn's story to Tyrion seemed verbatim from the book. And I was on the edge of my seat waiting to for his word to Tyrion that he would be his champion. Loved their scene. And the Bronn/Tyrion friendship is so well crafted in honesty. - Hot Pie...great to see him once more. And Brienne's look toward Podrick after Hot Pie spilled his info? PRICELESS! And can I just say that ten episodes a season simply are not enough!!!! Only three more...then what am I going to do?!?!?!?! I counted episodes last night and nearly cried again when I realized there were only 3 left! Not fair! Thanks for sharing your thoughts. Your comment about Tyrion and Bronn made me think that theirs may be the only honest relationship in the series. Or one of the very few anyway. Maybe Brienne and Pod? Hmmm, Brienne and Pod? (scratching my beard in contemplation) Maybe. i think that needs more time. Will be interesting to see how they treat that duo and how or IF the relationship evolves. Thank you very much for publishing this kind of article. I like your article a lot. I actually want to share my website details with you please produce some information to increase performance like as your website. More Frozen Meets Winter Soldier Fan Art! May the 4th Steals and Deals!